I got this a few years ago, I found it in Waterstones, went back to get it the next day and it was gone! The staff told me it was being sent back as nobody was buying it but we found it on a cart and they let me buy it. Most of the recipes look quite complex (the author is a chef) but I have made 2 things so far - the Creole Tempeh and the Split Pea Soup, both of which are really really good. I've never heard of it, is it a vegan or vegetarian book? 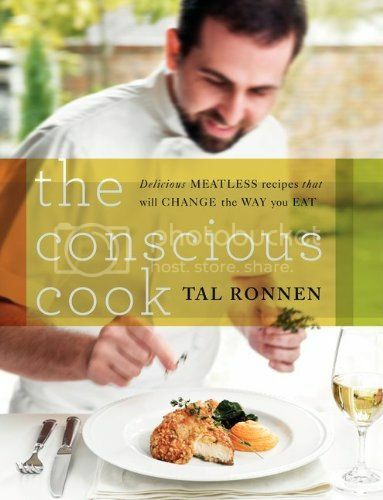 Everything is vegan, its a very interesting read as they have interviews with some vegan chefs & I think the author invented/helped with he creation of Gardein (not available in the UK anymore) and Veganaise (I read that part a while ago so will have to check). There are some rather unusual but brilliant looking recipes, even one for fresh vegan pasta (like egg pasta but vegan). I just saw in VegNews that he has just opened a restaurant in the US (LA maybe?) and was a chef for Ellen Degenerous (sp?). I think he was also on Oprah! I have now made 4 things from this (Creole Tempeh, Split Pea Soup, California Chikin Salad & Chocolate Chip Peanut Butter Cake), they were all brilliant. Respecting environmentally conscious meat eaters in the vegan/non-vegan forum? I'm interviewing vegans/conscious consumers - research subjects needed!